M&T Bank's Profitability Is Declining. Should Investors Run Scared? Return on assets is the most important profit metric in banking, and M&T Bank has gone from industry leader to middle of the pack. In a previous post, we explored exactly how M&T Bank (NYSE:MTB) made its money. Today, we'll move down the income statement and take a closer look at profitability. And unfortunately for M&T investors, profits this year have not been as easy to come by as in years past. Let's dive in. The easiest way to analyze a bank's profitability is to look to its return on assets. This number allows you to compare a bank's profit with that of the industry and its competitors of varying asset sizes. M&T Bank currently has about $97 billion in total assets, making it the 31st-largest bank in the United States. But thanks to the ROA metric, we can compare M&T with virtually any other institution. Over the past year or so, M&T's ROA has declined to a level well below its long-term average. The following chart shows that decline, as well as comparable ROA figures from two other prominent banks, Wells Fargo (NYSE:WFC) and US Bancorp (NYSE:USB). MTB Return on Assets (TTM) data by YCharts. 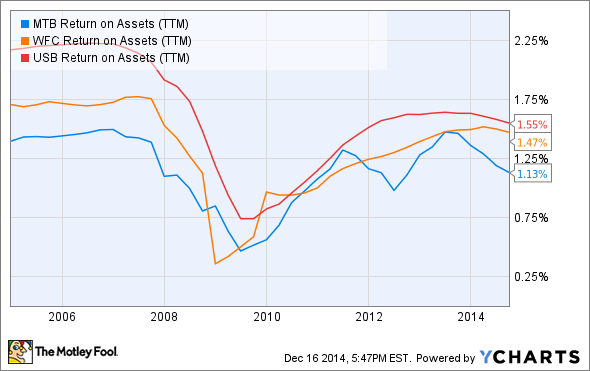 M&T's return on assets is still a respectable number in the bigger context of the U.S. banking sector, though. According to the FDIC's most recent Quarterly Banking Profile, the average reported ROA for banks with more than $10 billion in total assets came in at 1%. That means M&T's ROA is still 13% better than the industry average. The problem, of course, is not the actual ROA today; it's the trend. That 13% outperformance could easily disappear if the bank doesn't right the ship. So let's dig a little deeper to understand what's causing the decline and then determine whether we think it will continue or reverse. As previously discussed, M&T has solid core revenue driven by both its lending and non-interest income streams, and the bank's yield spread is strong. So we must look farther down the income statement to assess what's driving ROA downward. The efficiency ratio is a metric used to assess how well a bank squeezes profits out of its operations. A lower ratio is considered more efficient, meaning there are fewer expenses eating into each dollar of revenue. The following chart shows how M&T's efficiency ratio has jumped over the past several quarters. Before the tumultuous days of the financial crisis, M&T routinely sported an efficiency ratio around 50%. Lately, however, that ratio has crept up to around 60%. Source: M&T Bank's quarterly regulatory reports, compiled by BankRegData.com. Something has happened recently that is driving the bank's expenses higher without adding any new revenue as an offset. The higher level of operating expenses in the recent quarter as compared with the year-earlier period was predominantly attributable to increased costs for professional services and salaries associated with BSA/AML activities, compliance, capital planning and stress testing, and risk management initiatives. All of those new expenses are related to one ongoing issue at the bank: the yet-to-be completed merger with Hudson City Bancorp (UNKNOWN:HCBK.DL). The proposed merger was first announced way back in 2012 but has since been put on ice as the banks work to gain regulatory approval. What has the regulators so concerned? Issues with compliance procedures related to the Bank Secrecy Act and Anti-Money Laundering regulations -- the "BSA" and "AML" in the quote from management. The recent expenses that have reduced profitability at M&T Bank don't appear to be long-term in nature. Rather, they appear to be a direct result of hiring consultants, buying new software solutions, and generally beefing up the compliance capabilities of the company in response to regulatory scrutiny. The Hudson City acquisition will eventually add nearly $40 billion in assets to M&T's balance sheet; that's a huge deal that hangs in the balance until M&T can satisfy these regulatory demands. Investors in M&T Bank should rest easy knowing that the bank has, in fact, been able to maintain above-industry-average levels of returns on assets while absorbing all of these temporary costs. I fully expect that in the long term, M&T will overcome today's compliance issues and return to its historical level of profitability.